Successfully Added T10 Android TV Box - Amlogic Quad Core CPU, GPU Mali450, Android 4.4, Kodi, Airplay, DLNA, Miracast to your Shopping Cart. Get all the best that Android OS has to offer onto your big screen. From games and TV channels to the latest apps and browsing the web, the T10 Android TV Box will give you that and more – and at a reasonable price. Your big screen TV may be great all by itself, but there is one simple gadget that can enhance its capabilities even further. The T10 is a powerful and compact TV box, adding the Android interface to your TV experience. The TV box comes with an A5 Cortex Quad Core processor and Mali 450 GPU, giving you lots of muscle when it comes to simple everyday operations, as well as the latest games and fancy graphics. Android 4.4 give you access to lots of additional apps and tools from the Play Store. With 8GB on internal memory, you can store plenty of files right on the TV box or use an SD card (up to 32GB). All you need to so is hook up the TV box via HDMI and instantly enjoy all the added functionality. With Kodi (also known as XBMC) support, you also get a multifunctional media player on your TV, so that you can conveniently enjoy all your movies and shows with hundreds of channels available. 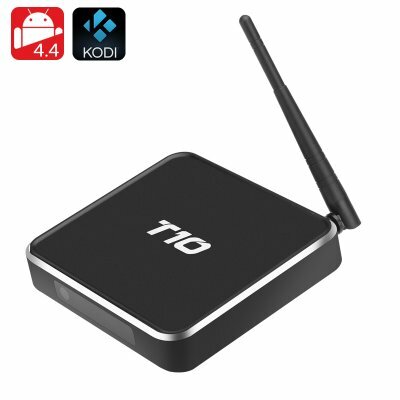 The T10 Android TV Box Android TV Box comes with a 12 months warranty. Brought to you by the leader in electronic devices as well. Great product. There is nothing like it. Now finally I enjoy watching TV.